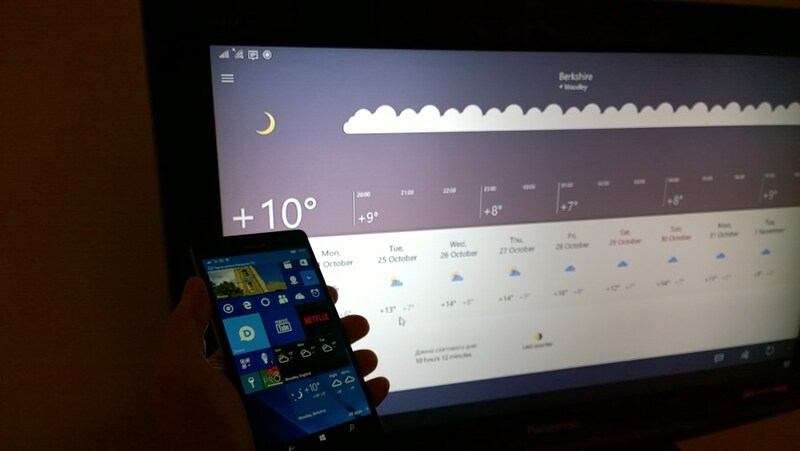 Windows Phone and Windows 10 Mobile aren't exactly starved of weather applications and we have another to throw into the mix. This one's a Continuum-friendly UWP app for Windows 10 of all varieties, but optimised mainly for the phone. 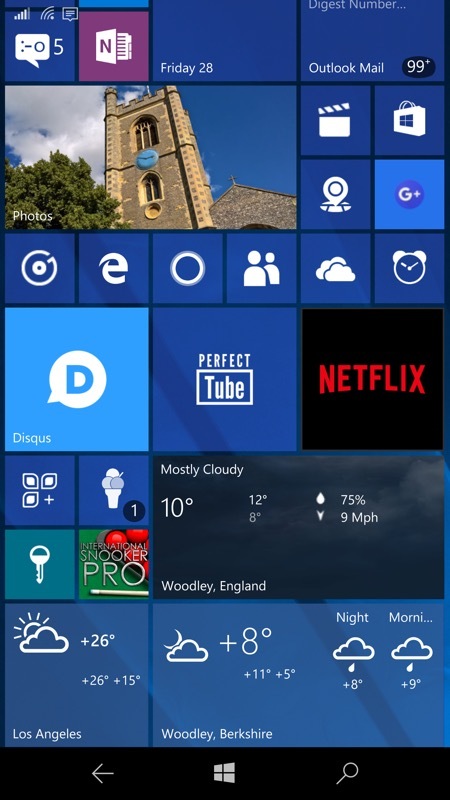 It's free, pretty and useful, and comes with a couple of live tile options. Yandex is a huge Russian IT operator and this is another way for them to get part of their content onto almost half a billion Windows 10 devices. 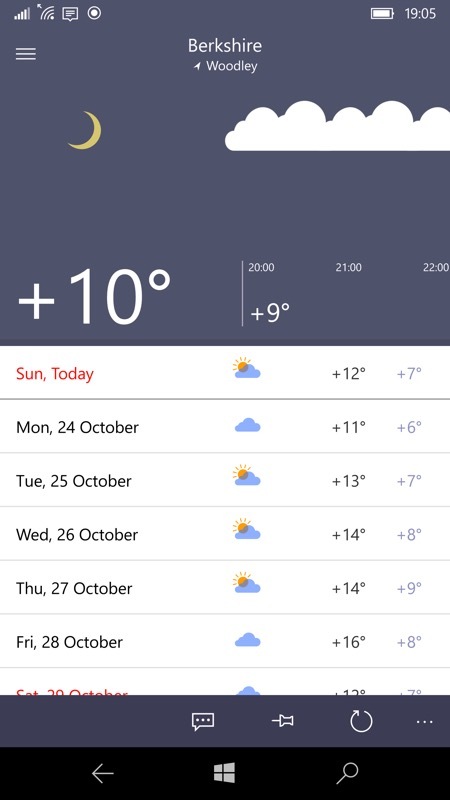 Yandex.Weather displays the weather in detail: both in hourly forecasts and for several days ahead. 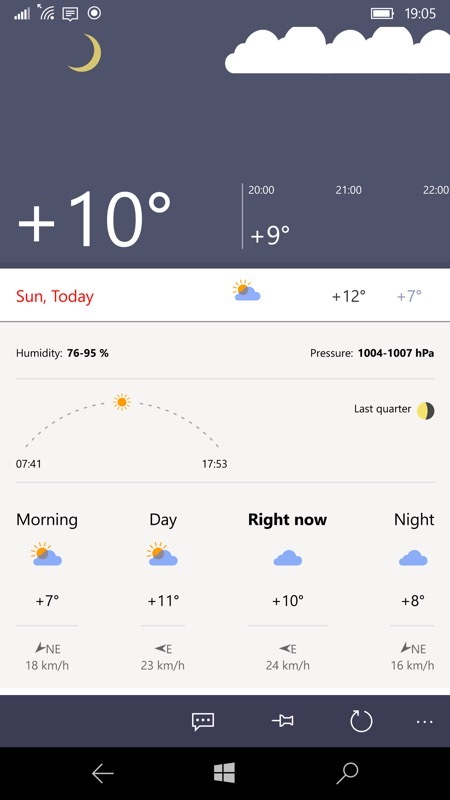 Yandex.Weather will also tell you when the Sun rises and sets, as well as what's the current lunar phase of the Moon. Stylised forecasts, complete with current moon phases - tap on any day to expand it with quarterly (as in 6 hour periods) predictions - note also the sunrise and sunset times, plus humidity data, all displayed with admirable space even if I'd rather have had larger fonts and less space! Turns out it's sunnier in LA, thousands of locations are available worldwide. 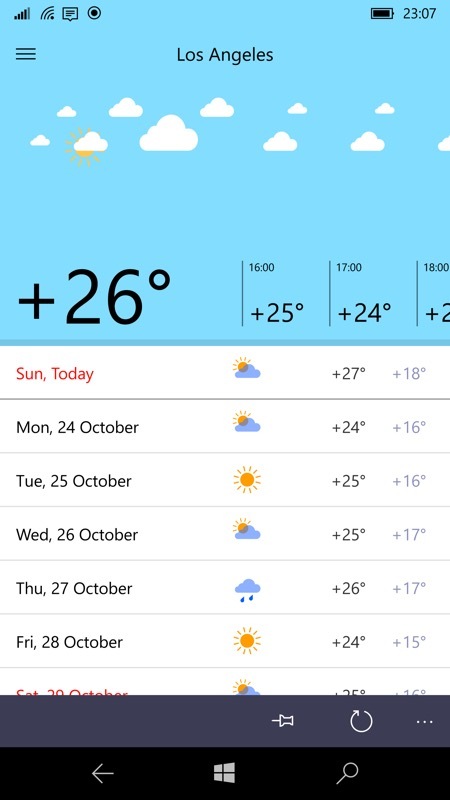 Note the 'pin' control in the bottom bar, by the way, that's to get the current location into a live tile; (right) a reporting facility is built-in, though I'm sceptical - just how many users are going to actually feedback weather every hour in every location to make such submissions worthwhile? Weather is constantly changing and can surely only be handled by huge central automated prediction systems? 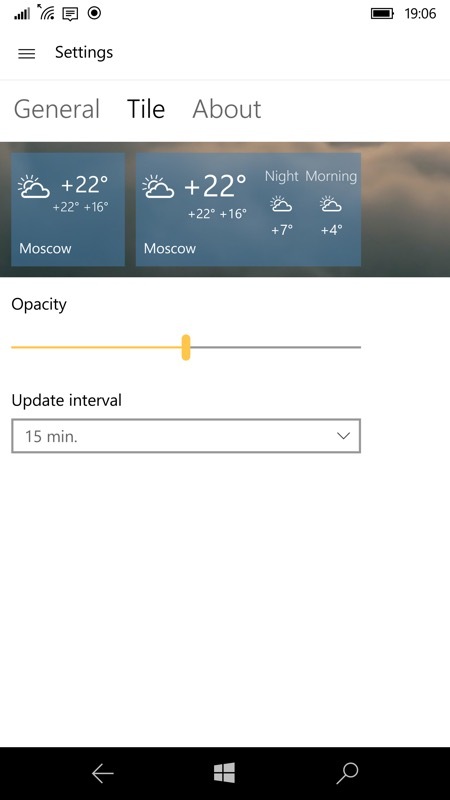 The bottom two live tiles are for Yandex.Weather, showing the two possible sizes, with the larger showing the next two 6 hour periods coming up. 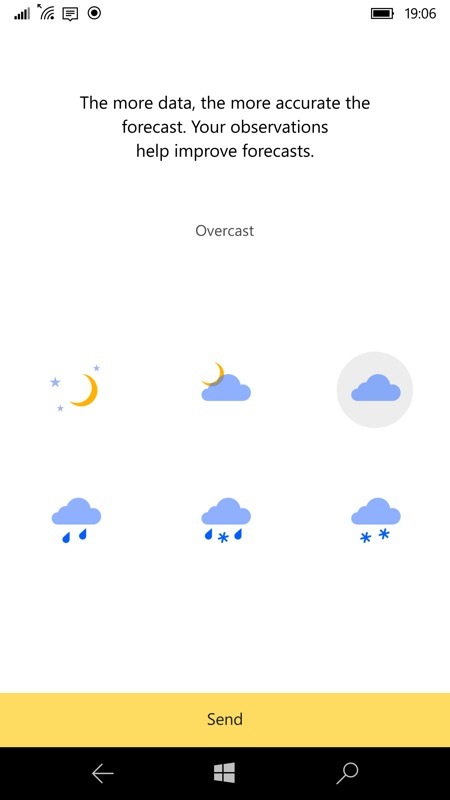 Although there's a live tile animation, it's not full working as yet and this is basically all you get - I'm sure updates will come; (right) '15 mins' is the quickest live tile update interval, but this is perfectly good enough for weather prediction. A decent UWP utility and very nice to have for free from Yandex. You can grab this for free here in the Store.